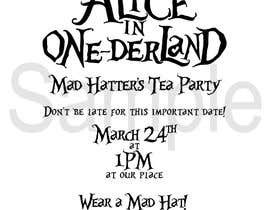 This is for my daughters 1st birthday party which will be Alice in Wonderland theme. I need the writing to be in black, size A5 in total, in the centre of an A4 page so I can illustrate around it. Create text in an “Alice in wonderland” style. #7 and #8 if need any changes give a feedback.